Hear Bowser's Inside Story on October 9th! Some exciting news here: Nintendo has just confirmed that Mario & Luigi: Bowser's Inside Story will be in your hands on Friday, 9th of October. The third in the respected Mario and Luigi RPG series, Bowser's Inside Story revolves around a mysterious infection called "The Blorbs" taking over the Mushroom Kingdom, causing Toads to inflate to many times their normal size and roll around uncontrollably. Not unlike a Nintendo Life staff party, to be truthful. 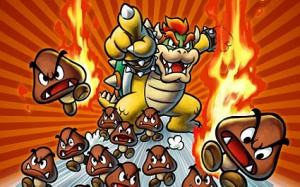 The battle system from the previous two Mario & Luigi games has been brought back for this instalment with the addition of Bowser as a playable character in and out of battle. 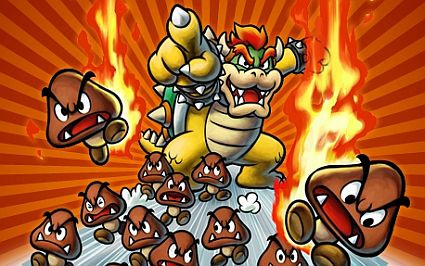 The Mario Bros. will move around inside Bowser's stomach trying to find a way out, while Bowser himself dukes it out inside the Mushroom Kingdom. If this game is anything like the first two, then you really shouldn't miss it. Are you as excited as we are? I thought it was coming out earlier, was it delayed? Awesome! Can't wait for this game! i've Just finished the one on the GBA 4 years after i first brought it, definely going to pick this up when its out. I don't know, i guess i prefer the real time action in Super Paper Mario.I'm still excited about this though. I wasn't thrilled about Partners In Time, probably the only one in the series i didn't like whatsoever.Superstar Saga was my favorite. I really look forward to this one, the previous two were great. Too bad I don't have any money at the moment. I wasn't keen on Partners in Time - I had a lot of difficulty with the controls for four characters. If you leave it and pick it up again, it's almost impossible to get back into. I never played Superstar Saga, reckon I have to, but still very much looking forward to Bowser's Inside Story. We Americans are getting Mario & Luigi:Bowser's Inside Story on September 14, 2009. Mario & Luigi:Bowser's Inside Story wiil released in Europe on the same day that Kingdom Hearts 358/2 Days is being relased in Europe. awesomeeee Ima gonna get this! Cool, the US gets this exactly 1 month earlier. Well, not exactly. It's September 15th.